← I’m a Certified Co-Active Coach! I am grounded in the Appreciative Inquiry model and philosophy and have been working on refining my work and making activities clear for each phase of the model. After years of working with the model, I have figured out ways to enhance it so that positive change becomes institutionalized and transformational. The Discovery and Dream phases are great when it comes to igniting possibility and getting people excited about a compelling future that is organic and emergent, however it does not go far enough. AI plants the seeds of possibility and I love that but the model can do even more when it comes to strategic planning, project implementation, project assessments and leadership coaching. AI is scalable and supports the notion that leadership resides at all levels of an organization, it can be used at the executive, management, and project team levels of an organization. 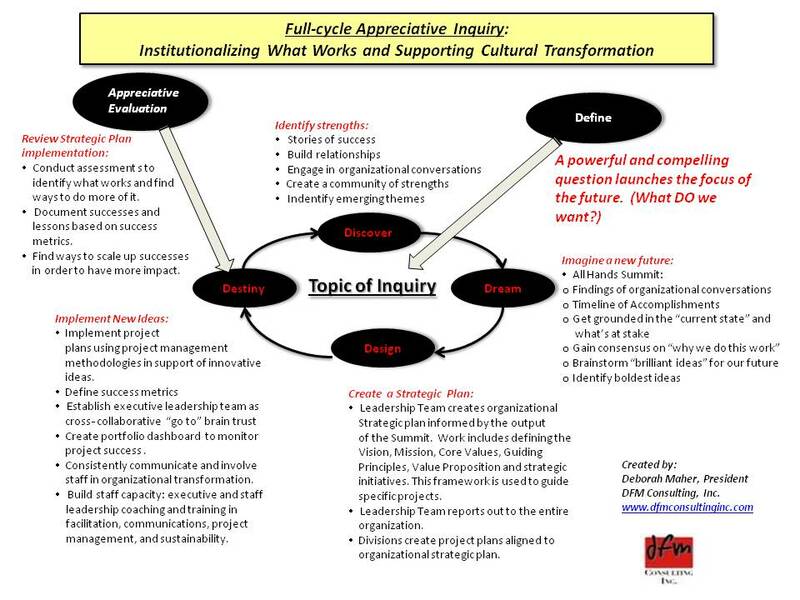 I am attaching my Full Cycle Appreciative Inquiry model so you can see how I am working with clients and can use AI at any point in the life cycle. Let me know your thoughts and be sure to contact me if you have an interest in learning more about my model. Just click on the diagram below and you will see key activities for each stage of the AI Cycle, including Appreciative Evaluation. Be sure to check out the book by Tessie Catasambas entitled ,”Reframing Evaluation through Appreciative Inquiry”.